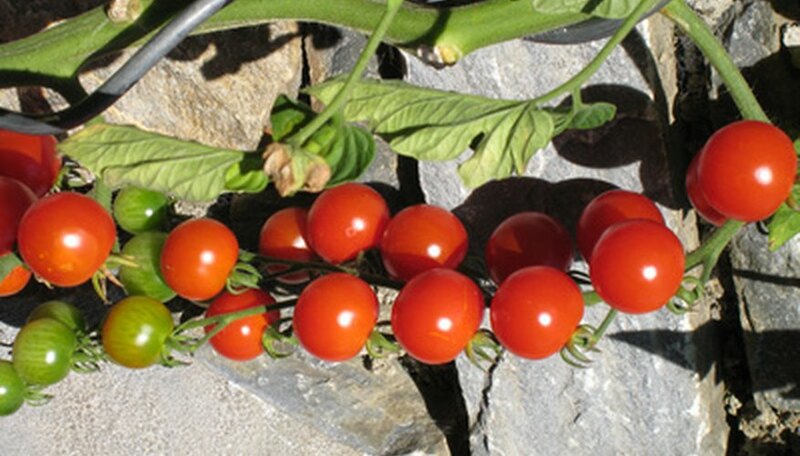 Most gardeners who have a vegetable garden try to grow a few tomato plants. Home-grown tomatoes are nearly always more delicious than any bought at a grocery store. Like most vegetables, tomato plants can be attacked by garden pests. Several kinds of bug sprays can help keep tomato plants insect-free and, therefore, healthier. Insects that prey on tomato plants, according to North Carolina State University, include aphids, whiteflies, cutworm, wireworm, stink bug, hornworms, flea beetles, potato beetle, cabbage looper, leafminer, blister beetle, tomato fruit worm and tomato pinworm. There are many commercially prepared chemical or organic bug sprays for use on tomato plants. Sprays containing neem oil, for example, kill or deter a variety of tomato plants pests, including aphids, cutworm and tomato fruit worm. You can also prepare organic sprays containing cayenne pepper and/or garlic. You can even use tomato leaves in a spray as an aphid deterrent, according to Canadian Country Woman. To make this spray, crush or chop 2 cups of tomato leaves and let this soak in 2 cups of water overnight. Strain the leaves out in the morning and place the liquid in a spray bottle. Add 2 more cups of water, shake the bottle and spray this on your plants. Spray the tomato plants with the bug spray in the morning and after you have watered the plants. Watering immediately after will wash off much of the spray. Spray all areas of the plant, including the underside of the tomato leaves where many bugs, including aphids, hide. Wear gloves to protect your hands, even if you are using organic sprays--some organic sprays may be irritating to the skin. In most cases, you’ll have to apply bug spray regularly throughout the season, rather than just once. Tomato plant bugs may deter growth or even kill plants. In addition, many of these bugs will travel to other areas of your garden, destroying the plants as they go. Checking plants for bugs and spraying when necessary will help keep your tomato plants alive and healthy. Check the label of commercial sprays, including organic sprays, before using to make sure they are safe for tomato plants. Check the label for how long you must wait before harvesting and eating tomatoes after spraying. Some sprays have a longer residual effect than others and tomatoes may not be safe to consume too soon after pesticide use (even if you wash them), depending on the spray.